It turns out one of Sue’s friends has started destashing her fabrics and they get sent to Sue and Ann. I get some also. This time Ann had started sewing this layer cake in half and adding a charm square to the corner. There was also a jelly roll of the same line. Upon beginning she just could not get excited over the color of the materials so I became the recipient.. Turns out Sue had a block panel of the same line of fabric. 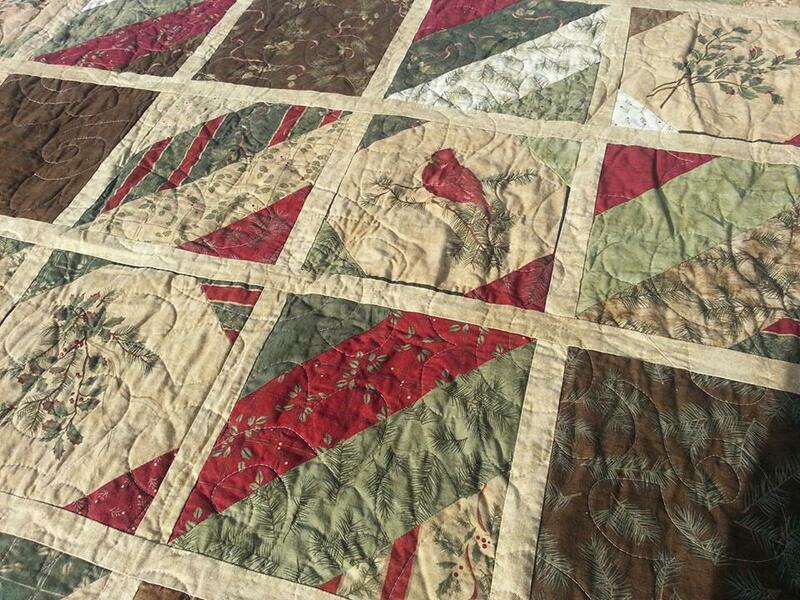 Now I had to decide what I was going to do with these blocks, jelly roll and panel. 1st thing I did was finished as many of the HST from the layer cake. How was I going to incorporate the 9 1/2″ panel blocks. Since the corners were cut off of the charm squares I used them to snowball the quilt. This really did soften the sharp edges of the blocks. At first I played with layouts on my design wall, then went to my EQ7 program till I found something that I was happy with. I have to thank the ladies from Life’s a Quilt FB group they were so helpful in choosing which layout to use. This is some of the layouts that I was playing with. Luckily I had some gold material that was almost the same as the background color of the bird panel. In two days I had the quilt top finished, now I just had to wait to get the batting that I ordered to finish the project. It took me a while cause this was set into the UFO (unfinished objects) pile but I did get to it eventually. I got it finished at a quilt retreat a couple of weekends ago.. I used it to show people how to quilt a large quilt on a domestic machine. Here is the directions as to how I made this quilt. From charm square place squares on each solid fabric corner draw a line on diagonal from corner to corner or the charm square and sew ¼” on the block side of the line. Cut on the drawn line. Don’t discard clippings will be used later in the snowball block. *I had 8 extra layer cake squares leftover they will be used later. Use these extra corners cut off from the striped block to make a snowball block from panel squares. Sew onto the cut off corners and trim off excess by squaring the block. Layout is 6 across and down. Each horizontal rows has 2 snowball blocks and 1 charm square block. The last 3 are striped blocks. Sew all your jelly roll strips together randomly. It’s easier to do it in batches of 10, Then cut to 6” to make striped strips. Now sew them into a long strip. Measure all sides to see how many will fit I sewed them then seam ripped off the extra. Sew to tops and bottoms of the strips and miter the corners. Sandwich, Quilt, and Bind with the same material as you’re sashing. Previous Canada’s Big Quilting bee. Thanks Ann for passing on the fabric. I could never have imagined that my love for cardinals and chickadees, the only reason I bought the panel, would result in such a fantastic quilted project, it is truly awesome, Renee.